There have been a surprising lack of female-fronted indie bands. Where do Hinds rate compared with The Breeders and The Long Blondes? (With apologies to Sleeper and Echobelly) Of course, Hinds are that even rarer thing, an indie band where all of the members are women. It’s really strange, even in an industry as sexist as the music one, that there have been so few successful post-punk all girl guitar bands. 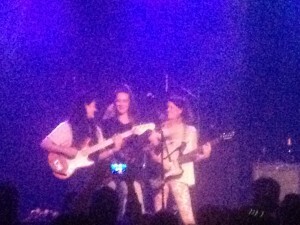 Especially when a band like Hinds can be so brilliant. I’d seen some live reviews which had indicated that Hinds could be slightly chaotic, eschewing such things as tuned guitars and playing full sets. The early Libertines had the same rumours circulating round them and it’s just the sort of thing that can lead to a really exciting gig or a really disappointing one. However, it seems that touring with ultra-professional Americans Public Access TV has rubbed off on Hinds. While the New Yorkers were slightly boring though, the Spaniards were anything but, although it was a touch unfortunate that at no point did it threaten to spin out of control. Musically, taking their cues from 60’s garage bands and Velvet Underground-esque C86 groups, Hinds not only sound good but unlike some modern guitar groups they actually seem to enjoy playing live. I can also hear some more modern influences such as Oasis (one of those grumpy bands I just mentioned) in San Diego and The Vaccines in Bamboo, both of which sound brilliant live. After quite a short set that sees most of debut album Leave Me Alone played, they encore with a joy-filled cover of Davy Crockett by Thee Headcoatees – perhaps if it had been December, it would have been Santa Claus by The Sonics instead After watching such a great performance, it feels like the NME readers have voted for the wrong act.